So I promised you easy, everyday family food and then give you shortbread. This is to make up for it. For those days when I have so much on my to do list I can’t think straight and whilst busy writing and testing a couple of recipes I don’t actually have anything for supper. For those days you need emergency food that can be conjured up from whatever you might keep in your fridge or larder. Any day of the week my daughter would choose pasta for tea. 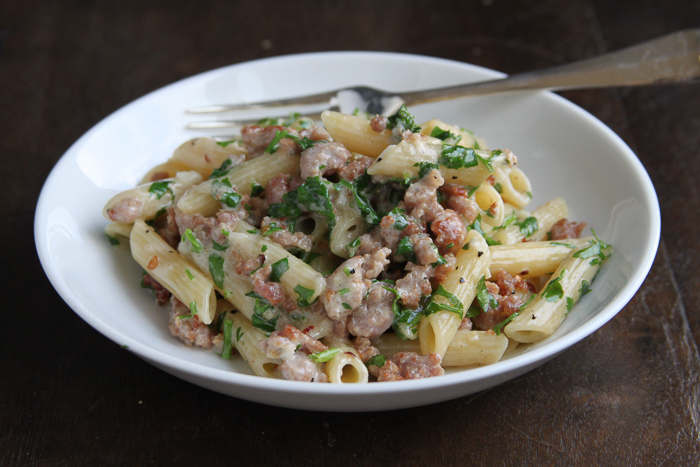 Ideally a Bolognese type ragu or this sausage pasta. My son however doesn’t like pasta or sausages…. Quite a conundrum and this tends to remain for days when he is out. I must stress though that of all the people, child or adult, who have tried this, he is the only one who doesn’t like it! I love this though and whenever I cook it for my daughter I hover greedily and wish I had thought of it for our supper. 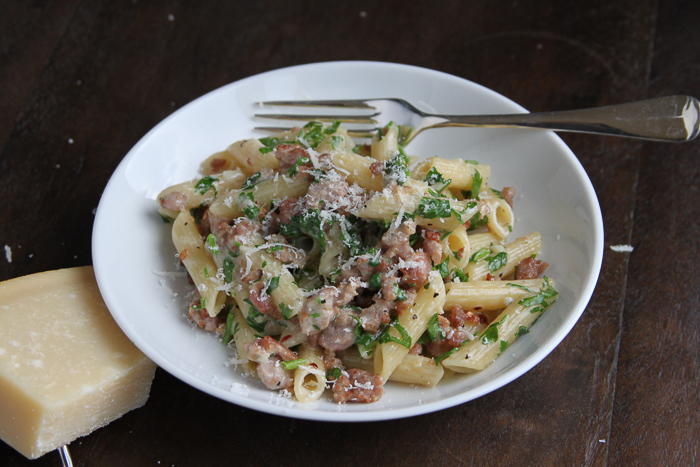 Speedy and simple, the sauce takes no more time to make than the pasta does to cook. Add as much or as little chilli as you like depending on your diners. I struggle to find spicy, Italian sausages around here so add heat with some dried chilli flakes whose smoky flavour is perfect here. Should you be able to find some genuine salsiccia (you lucky thing) the taste a bit once it is cooked before adding chilli in case it is not required. This is supremely comforting, quick, cheap and easy – what more could you want? I might add the some leaf spinach along with the cream and water if this is for our dinner letting it wilt in the heat of the sausage sauce. My daughter would be horrified if I did this to her favourite supper so I tend to leave the spinach out for her but sometimes I add some peas…..
Cook the pasta as per the packet instructions. Heat the oil in a frying pan and cook the sausage, breaking it up as much as you can. When it is starting to look a little brown and crisping around the edges add the garlic and chilli. Cook for a few more minutes to lose the rawness in the garlic and then add the cream and 3 tablespoons of water out of the pasta pan. 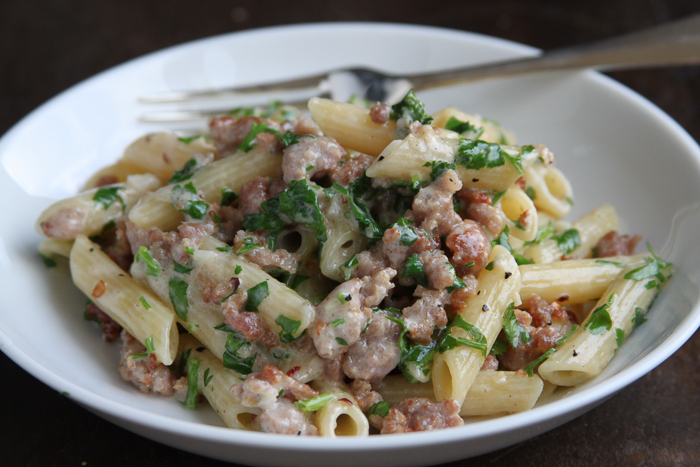 When the pasta is cooked drain then add to the pan with the sausage, give it all a good mix, taste and see what seasoning it needs then sprinkle over the parsley and serve with lots of grated parmesan. Enough for 2 but easily doubled or tripled.